To talk about the practice of organic farming, requires a farmer with knowledge and mastery of the elements that are combined in the farm, this is the understanding of the importance of how to manage or manage each of the available resources, as is the type of soil, water quality, disposition of light, humidity, winds, characteristics use and benefit of the so-called weeds, understanding of the role played by the main insects, birds and mammals that make up the fauna of the farm. Knowledge of which unfortunately we are very disconnected. In a higher step, is the practice of Biodynamic Agriculture, which integrates the variations of the Cosmos "Sun, Moon, planets and constellations" to choose opportune moments for agricultural activities and integrating various preparations called biodynamics that help and improve the production. Although this is still the highest expression of agriculture, Homeodynamic Agriculture, which differs from biodynamics, is in a more "evolved" degree. It uses homeopathic principles to give more strength and vigor to "old" biodynamic products. introducing a wide range of new products. The moment in which the farmer worries about a healthier and healthier production, he begins to worry and take responsibility for the beings that inhabit his farm. By understanding that organic agriculture is not the goal, but only a step to improve production, he becomes more observant of what happens on his farm and opens up to the world and becomes more receptive to the proper solution of his problems. . This process entails greater sensitivity towards the environment and each one of the beings that live there. And this is the real key to your success as a farmer and of course, as a human being. The success in the production is based on the attitude of the producer to the life that surrounds it. Loving the earth is essentially an attitude of life that must be consistent with our thoughts, words and actions. When a human being comes to integrate Love into his life, he radiates it around him and all the things he touches are contagious with a high level of harmony. Hence the importance of a change in behavior towards our productive environment. It is often argued that these ideas are a great ideal but in practice are mere fantasies of dreamy people or naive characters. That the reality is different, because to feed the world requires great technological advances in both machinery and biotechnology, and conceives production as the art of generating food mechanically and to the satisfaction of consumers who can acquire it, with a vision of which soil, plants, animals and human beings we do not differentiate ourselves from industrial machines. This vision only generates spiritually empty human beings. All these changes account for a new course or effect of the creative forces on Earth, are signs that something different and little known is happening, and therefore we must be consistent with it. We must adopt an agriculture of respect for the living, an agriculture of gratitude for the fruits we can harvest for our subsistence, a sensitive agriculture, humble, cheerful, warm, an agriculture where Love is the main input for productive success. Today we find much information, in media such as the Internet, of people who are spreading the principles of different agricultural techniques more friendly to the environment, techniques that integrate the knowledge of the ecological with the cosmos and the spiritual. So we extend an invitation to seek new production models according to the type of farms we manage, the type of crops or the animals we raise. Sites that share creative ideas to apply them with criteria and to our satisfaction. It is possible to transform a farm of intensive production to the practices of a biodynamic or homeodynamic agriculture, the answer is affirmative. What can be done in small can multiply big. The important thing is to take it to a human dimension, because the human factor becomes the main input for the success of production. Well, only man or woman can vitalize plants and animals with Love, only the human being can give harmony to the water that is supplied, to the fertilizer that feeds the plant, to the scissors that cuts the branch, to the seed that comes into contact with the soil for the first time to germinate, the fruit that is harvested. Agriculture is an activity that takes place in close relationship with the earth, water, wind, light, flora, fauna ... the Moon, the Sun ... the Cosmos ... and of course its creator ... the human being. Therefore, all knowledge and techniques used in agriculture must address, consider and integrate the indicated factors. In Ecuador, the agriculture that has gained many adherents is organic agriculture, which places particular emphasis on the use of inputs of organic origin, in particular fertilizers and some products for the control of pests and diseases. This system has been integrated the use of biological inputs, which in essence could be identified as the practice of organic farming. In these two systems, it is generally considered that no more knowledge is required, it is enough to apply the recipes to achieve a healthier production, which is a great truth against chemical agriculture, but a mediocrity against organic farming. 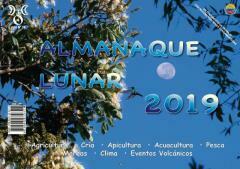 In the Almanac, the recommended days for 21 agricultural activities are indicated, which are oriented to achieve better results according to the characteristic required by each activity in accordance with the lunar rhythms. Hence, that the timely management of soils can reduce the incidence of pests that are housed in it and maintain its aeration for a longer time; of a timely sowing will achieve plants more productive and resistant to the attack of pests and diseases; in the transplant achieves a greater seizure; with pruning improves the quality and quantity of fruits without weakening the plant; in the grafts a better seizure is achieved; the compost or fertilizer has a faster maturity and quality; pasture silage (mowing) is conserved for a longer time; the cut wood has a longer duration and is not attacked by insects; the harvests are conserved by more time and their flavor, smell and texture are more adapted; By controlling fungi and insects, better results are achieved due to their effectiveness in the days when they are most vulnerable; when fertilizing, greater use is made of the plant with less fertilizer; With irrigation water penetrates and stays on the ground for longer. Recommendations are specified for animal breeding activities, many of them require the intervention of a veterinarian. By castrating at an opportune time, bleeding and infection are prevented; in worming, worm control and fungal control, a greater and effective decrease in parasites is achieved in less time; when shearing on a suitable day the wool obtained has higher quality and will grow back with good shine; By stimulating the production of milk by means of medicinal plants on the indicated days, you can achieve a good increase; to achieve a more effective and lasting cleaning of cages and stables. Knowing when to buy the chickens can achieve birds with greater ease of assimilation of the food and the consequent increase in body weight in a relatively shorter time; or when purchasing chickens for posture with higher production per bird. In the breeding of guinea pigs and rabbits by placing the males in the cages of the females at the right time, their mistreatment and a good degree of pregnancy are avoided. The health of the animal will depend on the quality of feeding that we know how to administer, to achieve this goal it is important to vary the percentages in quantity and diversity of the food supplied and even subjecting it to a monthly fast according to the indications of the Almanac as explained in number 8. Be sure that this will not lower productivity and you can save on food and medicine. Bees are very sensitive to the energetic changes coming from the celestial sphere, the most suitable days are indicated to perform 6 beekeeping activities, the same ones that will favor the quality and quantity of honey collected. When reviewing or inspecting the hive on the indicated days, we allow the cosmic energies to stimulate the bees to make honey with good texture; adequate days to achieve a strong and healthy swarm; to achieve the formation of new alveoli with good structure and consistency; with a queen born on a favorable day you can improve the production of the honeycomb; the harvest made on a suitable day guarantees a honey of good consistency and flavor. In general you should avoid doing work with bees on the days and times indicated with the vegetable symbol of the leaf. The activities that take place in direct contact with the water are intimately related to the lunar influence, and for the success of them they must work in harmony and harmony with the lunar rhythms. The success of this activity will undoubtedly depend on the right moment to dig and fill the pools, in such a way that they consolidate and do not erode easily, in addition to the optimal time to clean them; to achieve a greater number of fertilized eggs in laboratories of shrimp larvae or in fish farms and that larvae or fry are stronger and the death rate is reduced; so that when changing the environment, fish or shrimp are sowed with a low mortality rate; to achieve better results in the fertilization of swimming pools, phytosanitary control and deworming in both fish and shrimp; to harvest seafood and shrimp with greater weight and meatiness and; in the work of artisanal or sport fishing a greater number of fish is achieved and with less effort. The success of any productive activity depends on the real opportunities of sale of the product or service we offer, understanding that not everyone has the skills for success in business, but at least we can try to make an effort in this activity in the periods indicated monthly . It is unknown to anyone that in business there is a kind of luck factor, because some are easily given, others go through a wait, others despite being very promising end in a resounding failure, at other times we are victims of scams, assaults or some kind of adversity. In order to reduce difficult circumstances, the loss of time in a business that does not flow or simply avoid starting an activity without the possibility of success, follow the recommendations indicated. 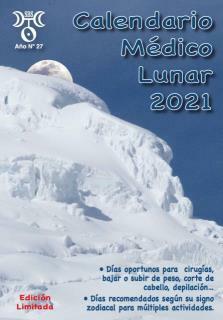 The Lunar Agricultural Calendar and the Lunar Almanac was born in the mid-1990s as a particular initiative to support agricultural production in Ecuador and later livestock, beekeeping and aquaculture production. The original source of information is the principles of biodynamic agriculture with adaptation to the tropical zone. Although, originally it was aimed at an exclusive use for the practice of agriculture without chemicals, an organic agriculture, since it was argued that with the use of chemicals the lunar influence was neutralized. However, it was found that this was not true, because those who practiced chemical agriculture achieved better results when they performed their work on the days indicated, and even required less chemical inputs to obtain a satisfactory production. Faced with this reality, the Almanac and the Agricultural Calendar have a general projection in the productive practices, whether it is a chemical, organic, biological, ecological, biodynamic or other agriculture. The calendar is born and justified by the use and abuse that human beings make with chemical inputs, inputs that constitute a shameful poisoning of the environment, its resources "soil, air, water" and all the beings that inhabit it. Sad is the case of the old agricultural communities with children, youth and adults with physical or mental disability such as the case of Samborondón in the province of Guayas (Ecuador), in which chemical products with residual teratogenic effects were used and continue to be used.